Benjamin Thurston was born on 4 May 1695 in Newbury, Massachusetts. His parents were Daniel and Mary Dresser Thurston. He was a second generation New Englander, as was his wife, Mary Gage, who was born in the neighboring town of Bradford. Benjamin's father and grandfather had been husbandmen, making their living off the land. They had both raised cattle, pigs and sheep and harvested salt marsh hay for feed. Benjamin took another track and became a carpenter and joiner. Benjamin and Mary published their intention to marry on 17 March 1717. They married on 24 June 1718. Just prior to his marriage Benjamin bought land, 26 acres, in Bradford, from John Watson. In 1719 he bought the remainder of John Watson's land, about 30 acres, including house, orchard and fences. Presumable this is where he and Mary made their home. When the deeds were filed Benjamin was described as a carpenter. Since his father was not a carpenter, he must have learned his skills from someone else. He might have been apprenticed to a local carpenter or sent to live with one, in the tradition of "sending out" of children. Benjamin did not buy additional land until 1733, when he bought a tract of land in Bradbury bordering Little Pond. Also that year he bought of Abraham Hazeltine land in an area of Bradford known by the wonderful name of "Dismal Hole". He made a few other land purchases, including a thatch island from the heirs of Phillip Attwood before making a large purchase in 1740. He bought over 40 acres of land from John and Samuel Green as well as buying out a mortgage on land they had sold but whose new owner had defaulted on the sale. At his death he still held the land in Lunenburg, Maine, that he inherited from his father. We know from his land deeds that Benjamin was a carpenter, but he also made furniture. The inventory of his household goods, done for the probate of his estate, include unfinished tea tables and desk and pulpit. He also had a lot of finished furniture, which he must have made for himself. At his death, Benjamin owned one horse, four cows, two oxen, three calves, six pigs and fourteen sheep, so he did some husbandry. On his headstone, Benjamin is given the military title of Quartermaster. None of the Massachusetts Militia records are online. If anyone is ever headed to the Mass Archives, maybe they could look up Benjamin and see exactly what he did. Benjamin married Mary Gage of Bradford, daughter of Nathaniel Gage and Mary Weeks, on 24 June 1718. He was 23 and Mary was 21. Benjamin did not marry Sarah Burpee. Two of his children died in their 20's, both after his own death. Two of his daughters left Bradford, one to Maine and the other to Connecticut. His son Daniel played an active part in the American Revolution. One other thing that stands out is Benjamin had only six children, he father and grandfather had 12 and 13. Benjamin became a full member of the church on 7 June 1719 his wife Mary on 24 Jan 1720. Benjamin wrote his will in May of 1746, he died four months later, I wonder if he had been ill, as he was not all that old. He was 51 years old when he died, his youngest child was only six. 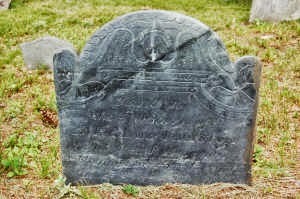 Sadly, his second son, Nathaniel, died three months after his father, in Dec of 1746. Mary Gage Thurston did not remarry after her husband's death. 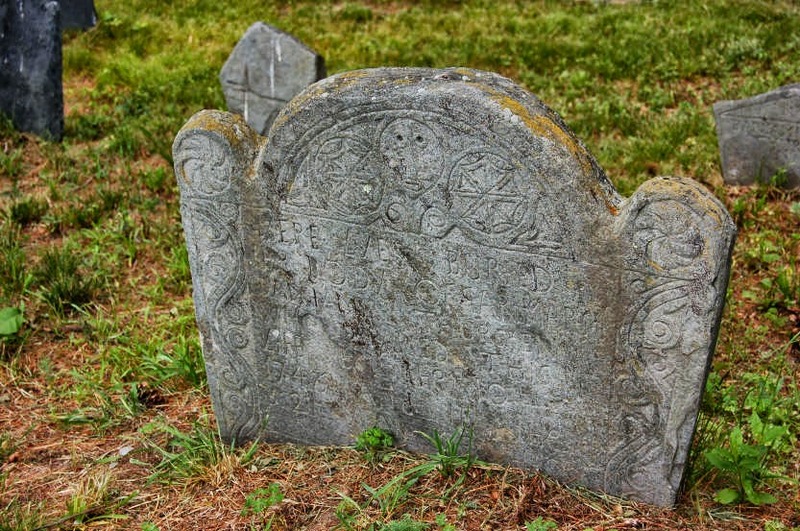 She lived to the age of 80, dying in 1778. Both Benjamin and Mary were buried in the Bradford Burying Grounds. When Benjamin's great uncle Daniel died his household inventory was about 1/2 a page. Benjamin's runs on for over three pages. His inventory included the usual necessary items for daily living but also included such things as a looking glass. He also owned a clock and an ink well, and I'm sure he could read and write, he also owned some books. When Benjamin died, his son Nathaniel was married and living on the land that Benjamin had bought from John Green. His son Daniel got his father's house and land. The four girls were all given money for their part of their father's estate.